A web interface for the popular 'Getting Things Gnome' organizer and notes taking application is in development. It is being developed by Karlozez as a part of Google Summer of Code. 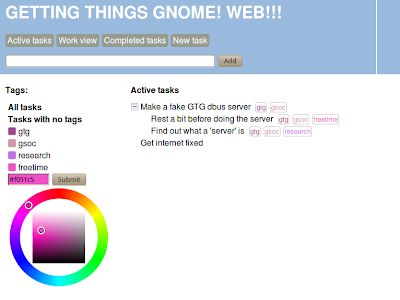 It will feature some nice features like colored tags and synchronization with desktop GTG and other applications. What’s it about? It’s about clouderizing(TM) your tasks. Your tasks will follow you wherever you go, you will have them on every computer, on your cell phone, at work, on holidays, you will never get any rest because you can’t escape from things you should do anymore.